The young man gazed over the current’s soft folds as the pilot smoothly maneuvered the canal ferry out of the central traffic lanes and brought it toward the end of the dock projecting from the right-hand bank. Thoughtful brown eyes considered the scene from beneath a mop of hair the color of dark cinnamon. He was well-built, though not heavily-muscled. Broad shoulders were offset by a certain wiriness, the product of both physical labor and regime of exercise. The pilot’s task completed, the ferry sidled against the edge of the dock, secured to the moorings by the efficient actions of the crew, and he bent to gather his belongings from where they sat at his feet. “Ahoy, lad!” a deep voice called out. Elias Conner looked up as he stepped from the canal boat onto the wide dock jutting into the slow current. His employer, Lady Penelope Hillcrest, Fifteenth Baroness Botelier, had sent him to the Martian territorial capital of Barsoom several days earlier on what ought to have been a fairly simple errand: to direct the transfer of a certain sum from her personal accounts to those of Themis Holdings, Ltd, the cargo carrier corporation she owned. He’d been given a travelling allowance for passage and lodging expenses, as well as a letter authorizing him to act on her behalf. Elias had been extremely proud to have been given the responsibility. But the teller had balked and Elias had been required to speak with a senior clerk, who had desired to refer the matter to one of the junior partners. This delay had forced Elias to return to the bank the following day, when he’d planned on an early departure. He’d forced himself to remain calm that next morning, standing straight while keeping a neutral expression on his face as the partner, a middle-aged man with a narrow mustache, carefully read and then re-read the letter as he periodically examined Elias over the top of the paper. Finally, the man had pronounced everything to be in order and directed the transaction to be carried out forthwith. Elias had heaved a sigh of relief as he’d exited the bank and caught a cab to the aeroport at the edge of the capital city. Somewhat later than he’d intended, he then boarded the canal ferry for the final leg of his return journey. The contrast with his previous life could not be greater. It had only been four years ago now that his mistress had plucked him from the back-streets of Aphrodite, where he’d managed to survive by petty theft in the years since his parents had died, two steps ahead of starvation and a half-step ahead of the constabulary. But with their encounter that soggy Venusian afternoon, his life had changed forever. Elias shook himself from his reverie as he walked the length of the dock toward the man waiting at the landward end. James O’Rourke was a merchant captain who’d lost his vessel, his contract, and his reputation in a pirate attack nearly a decade ago. He now commanded Lorelei’s Remembrance, the primary cargo vessel owned by Themis Holdings, Ltd. and thus by the baroness herself. Over their frequent encounters, Elias had come to look upon the captain as something of a second father. The captain, for his part, had reciprocated the relationship and taken Elias under his wing. For the last two years, he’d been training with the captain, working toward his initial pilot’s license. Six months ago, he’d applied for the required examination, but had been turned away by the attending clerk for lack of adequate documentation. Applicants were required to have attained the age of eighteen years and while Elias and his employer, who was herself licensed to operate modest craft on open-aether journeys between worlds, were both certain he was at least a year beyond that minimum, he possessed no records to demonstrate that fact. In the end, O’Rourke had formally vouched for his student, using his standing as a merchant captain to satisfy the clerk’s requirements. Elias had then proceeded to pass the written examination and the subsequent practicals with solid marks. His license had arrived in the post two weeks prior to his trip to Barsoom. While he now had the ability to lease and operate a small atmospheric-capable aether-vessel independently, the next step in his plan was to acquire a ship of his own. But this milestone was still many years off, despite the savings he’d squirreled away so far. Even a small vessel did not come cheaply. Meanwhile, Elias’ vision had continued to develop and during his trip, he’d finally settled on a name. The thought made him smile, though he wondered if he’d actually have the courage to declare it when the time came to put pen to paper on the forms. The two men headed up the switchback path that climbed the embankment. Stairs would have been more straightforward, but the sloped path enabled the movement of cargo-laden carts and were standard features along the canal system. As they crested the embankment several minutes later, the estate lay spread before them: the main estate house in the middle distance, the stables and several storage buildings scattered over the terrain. To the north, low hills rose, segregating the nearer grounds from the broader holdings of estate lands beyond. It was about a twenty-minute walk to the estate house and the two followed the level roadway leading from the canal. As they approached the estate house proper, Elias was struck by the unusual quiet. The typical bustle from the stables and the kitchens was notably absent. He glanced over at the captain, but the other man seemed oblivious to their surroundings, chatting amiably about the most recent cargo run of the Remembrance. O’Rourke opened the front door himself, which Elias also thought odd. The unusual quiet extended into, even seemed to emanate from, the interior of the house. “I believe her ladyship said that she would be waitin’ in the parlor,” the captain indicated, waving Elias ahead. Mentally shrugging, Elias stepped forward and led the way down the hall after setting his travel-bag off to one side of the entranceway. He knocked lightly on the closed door. “Lady P?” And pushed the door open. A flood of light and sound assaulted him and he took a step backward involuntarily. The entire staff seemed to be crowded into the room, every face bearing a broad smile. Elias looked around, perplexed, as the captain prodded him forward. “What is going on?” Elias looked over to the other man, who said nothing. “Elias.” There was only one voice which carried that rich, melodious tone. Only one which struck his heart in that peculiar and impossible way. Penelope stepped from the crowd. “I’ve had researchers combing through Venusian census records for years now, ever since our Vulcan mission,” she replied. “Two months ago, they found this.” She handed him a thick sheet of vellum, heavily creased from having been folded quarto. He looked down at the document, forcing his hands not to tremble as he read and reread the words. Date of Child’s Birth: Eighteenth Day of January in the Year of Our Lord Eighteen Hundred Eighty-Six. The gathering went on for some time, but even birthday festivities begin to wind down after a while. When it had become apparent that everyone had had their fill of the delicious spread that the cooks had prepared, Elias figured the evening was coming to a close. But then Penelope stepped to the center of the room and clapped her hands loudly. Elias looked over to the captain, his eyes full of questions, but the older man only smiled innocently and motioned toward the doorway. Elias followed as everyone filed out of the parlor and the estate house, making their way as Penelope led them towards the storage barns. Because these were set off a distance from the main house, and at an angle to the approach he and the captain had taken from the canal docks earlier, Elias only now saw that a wide canvas sheet had been strung up between two of the barns, like a sail some stories high. Penelope stepped to the corner of one barn, where a rope hitched to a stay fastened to the barn wall held the canvas in place. The captain mirrored her on the opposite side. Elias watched, stunned, as Penelope and the captain released the ropes and the canvas sheet dropped to the ground to reveal a weathered-looking but solidly-built dirigible. It took him all of two seconds to recognize the craft he’d trained in these past years. “You’re giving me the Song?” he sputtered, incredulous. A sudden hush fell on the assembly. Then the captain broke into a loud guffaw and slapped his thigh. “I tell you, a heart of pure gold and balls of solid brass!” The tension broke and everyone began to laugh and cheer. Amid the commotion, Elias risked a glance at his employer, who was laughing and smiling along with everyone else, but whose eyes bore an expression he could not read. The next day found Elias and Penelope settling into their suite aboard the liner Jason’s Quest, en route to Earth. While he’d barely unpacked from his trip to Barsoom, over the many years of working alongside his mistress, Elias had learned that sudden departures and frequent alterations of schedule were more the norm than the exception. And so, he’d taken Penelope’s announcement of their pending travel to London in the aftermath of the party in stride. “The new Hephaestus chairman is certainly making a splash,” Elias commented as he handed his employer the newspaper he’d brought from Barsoom. A photograph of the man, with trademark mustache and pince-nez, dominated the front page. In characteristic form, his top hat was held in one hand, his arms frozen in mid-gesture. The moving-picture newsreels were the better medium, Elias thought, for capturing the man’s powerful presence and the robust movement which punctuated his addresses. Since his elevation at the sudden death of his predecessor several months ago, the man had been everywhere. “Barnstorming,” some in the press had come to call it. “What do you think of his arguments, Elias?” she asked, bringing his mind back to the present. She looked up at him from her armchair, her eyes curious. Her question was not an idle one, Elias knew. Unlike many of the well-to-do, Penelope had a certain sympathy for the laboring classes. She never treated anyone, from her household staff to the maid of a hotel she might only stay at once, with anything less than respect. Elias nodded to himself: she was a rare one, and that only cemented his own admiration for her further. Penelope nodded, gesturing for him to continue. The late winter afternoon was bright and clear when their ferry from the orbiting liner docked at the aeroport outside of London. A cab-ride later, they arrived at Penelope’s townhouse in the city, where her loyal house-staff, the Porters, had prepared for their arrival, a fine supper being ready only a short while later. Elias slept well that night, but wondered what the next days would bring. A short while later, the cab came to a gentle halt; a request for the driver to wait for their return was confirmed by a silent nod. As the two of them stepped through the lich gate and onto the cemetery grounds of St. Matthew’s, Elias looked over the monument-laden landscape for the structure to which the two of them were headed. He’d been here only once before, two years prior, but the experience was memorable enough that he recalled it with ease. It had been spring on that occasion, and as the light snow and heavy frost crunched underfoot, he considered the contrast. The structure itself became visible only a short way through the grounds. Penelope’s great grandfather, the Twelfth Baron Botelier, having been caught up in a resurgence of spiritualism near the beginning of the last century, had become convinced that he had been Xerxes the Great in a prior life. He therefore had constructed a mausoleum suited, as he saw it, for such honors. His imagination had been stronger than his scholarship, however, and the resulting building was a mishmash of Persian, Egyptian, and Greek influences: bearded sphinxes, marble columns, and stone braziers flanking the entranceway of the marble structure. Fortunately for his descendants, the Baron’s budget had been more limited than his fantasies, and the mausoleum, while ornate and somewhat gaudy, was of only modest size. Nonetheless, not to allow the extravagance to go to waste, it was deemed by following generations that the bearer of the title would be interred within so long as room remained. Elias recalled the engraved marble block on the exterior identifying the mausoleum’s most recent inhabitant and his employer’s somber face as she gazed upon it at their previous visit. Half the niches within had been filled; three remained open. “Hold there!” Penelope commanded, her voice echoing in early winter morning air. Elias caught sight of a boy standing beside the mausoleum, a circular wreath in his hands. The boy looked up, startled, but set the wreath against the stone wall and turned toward them as they approached. “Who are you and what is your business at my family’s crypt?” Penelope challenged the boy, her voice low and hard. “Yes, my lady.” He gave an uncertain bow and scurried away. Elias watch him depart, but he noted that his employer’s gaze had returned to the circle of green boughs and white blossoms resting against the granite. “My lady?” he inquired. Elias pondered the meaning of that encounter as he stood slightly apart to allow his mistress space to sit with her father. The sun was well past its peak and beginning its descent toward the horizon when he heard Penelope come up behind him. He let her be the rest of the day, busying himself in his own studies. Over the years, he’d learned when it was best to let her alone. The following morn, shortly after breakfast, Penelope and Elias departed for their appointment. Elias found himself surprised, however, when their cab delivered them to a private estate rather than one of the numerous government buildings. Elias looked questioningly at his employer, but she said nothing as the two of them stepped from the cab and made their way to the ornate doors of the residence, which opened at their approach. A tall, thin man in the austere dress of those in the service of the upper classes greeted them with a curt but courteous welcome and bid them to enter. After closing the door, he turned to them and gestured toward a wide hallway to their right. The butler led the way in silence, his face carefully devoid of all expression. Traversing the length of the great hall, its arched ceiling high overhead, he stopped before a brace of doors at the far end. With the unspoken eloquence and quiet grace of one long in service, he opened the doors and announced them. Elias followed Penelope into a voluminous study. Lord Salisbury reclined on one end of a small couch flanked by two sitting chairs, this ensemble occupying one end of the room and set before a massive stone fireplace in which an equally massive fire blazed. On the far end of the room, an impressive desk sat before a large window overlooking the gardens. Floor-to-ceiling bookcases framed that window, just as a pair of large oil portraits framed the mantle of the fireplace. Elias considered the man, arguably one of the most powerful individuals in the Empire and one of the significant players in the great game of chess that encompassed entire worlds. And yet, regardless of that power, ashen and weakened by illness and age. “My lord…” Penelope began, but Salisbury waved her into silence with a weak gesture. Penelope sat in one of the armchairs, while Elias took its companion opposite. Salisbury nodded. “The problem of Vulcan remains unresolved. Vulcan is in many ways the fulcrum on which this balance rests. A knowing silence seemed to settle in the room, though Elias felt as perplexed as ever. He looked across at his mistress as she said slowly, “If a small portion of the crystals in the sample had no augmentative power whatsoever, then the performance of the overall sample would be diminished by a proportional amount. If the supply were be contaminated in some manner...” She trailed off. “You understand my thoughts exactly, my lady,” Salisbury agreed. Elias glanced back and forth between the two in the quiet which followed. Salisbury’s coach waited from them outside the residence, a courtesy of which Elias took silent note. But he could not refrain from interrogating his mistress as they took their seats facing one another and the driver nudged the horse forward. When Elias’ perplexed expression remain unchanged, she leaned forward slightly in her seat. Elias held his tongue until their return to the townhouse, respecting his employer’s thoughtful gaze out the cab window, but once they’d settled themselves in the study, he did not refrain from peppering Penelope with questions. They departed for the moon two days later, Penelope desiring to have the letter Salisbury had referenced in hand. An uneventful ferry trip consumed less than four hours, the majority of which was spent in the departure and arrival maneuvers. Penelope arranged for rooms at one of the city of Diane’s many hotels after assessing the cargo carrier schedules and seeing that Lorelei’s Remembrance was still nearly a day from port. The captain met with them for dinner the following evening after the ship had docked and the transfer of cargo had begun under the watchful eye of his first lieutenant. O’Rourke nodded as Penelope described her intended purchase and the captain’s role in the process. “When would you be available?” she asked as their meal wound to a close. Le Fey d l’Eau was a well-wrought craft, though very modest in size. An aether-only craft, she was a good thrice the size of O’Rourke’s old (and Elias’ new) vessel. With this additional space, she was able to accommodate a number of luxuries which the Promise could not: a more powerful aether propulsion system, a separate stateroom, and Edison gravity generators, among others. Elias nodded at the captain’s assessment of the vessel’s soon-to-be-former owner. He and Penelope had had dealings with James Morgan, an independent merchant captain of considerable wealth, some years before. The man was cunning to a fault and prone to sharp business practices, a slippery ally at best. “You and Elias both. No,” Penelope cut him off. “You should both be made aware of this. My title and the real property of the estate will pass to my cousin, Gerald, as provided by law. I have no control over that aspect. However, the balance of my possessions are mine to dispense as I see fit. “Your ladyship…” the Captain protested. “Thank you, my lady,” Elias responded. And meant it. Having confirmed her own assessment of the craft with the captain’s opinion, Elias’ employer lost no time in completing the sale and filing the necessary paperwork to transfer ownership. Less than a week after their arrival on Luna, the two of them had moved their belongings on board and Penelope was supervising the delivery of supplies for a journey of several weeks. She had not yet, however, shared their destination with Elias and he wondered for what section of the Belt they were bound. As they settled their chairs in the forward cabin and began to work through the pre-launch checklist, Elias noticed a small box, roughly eight inches square and half again as high, strapped to the console in an open space midway between the pilot’s and co-pilot’s controls. A pair of wires extended from one side of the box to a junction on the control panel. “Like a beacon,” he commented. Elias nodded at that very sensible notion and turned his attention back to the console. Their pre-launch checks were completed a short time later and Penelope exchanged final communication with the control tower via the chattering telegraph key. With her characteristic half-smile, Penelope released the landing gear by manipulating one of the levers on the console between their seats and the craft rose gently from the dock. Slightly less than an hour later, the lunar sphere was falling steadily behind them and they were clear of the threads of incoming and outgoing traffic converging in lunar space. Penelope adjusted several settings on the command console before her, then toggled a switch set off to one side which locked those settings in place. Elias nodded. “Standard proof by contradiction,” he responded. “The logical conclusion is that one or more of the premises is invalid. But how would that apply…?” He trailed off. Penelope stood from her seat and motioned for Elias to follow. She pulled out a high-level chart of the inner system and lay it on the low table at the back wall of the compartment. Numerous marks within the region of the Belt were accompanied by dates in small, precise handwriting. From each of those points, a line extended sunward, halting at the interception with Mars’ orbit. The lines did not show a particular pattern, some angling one way and some the other, with a few being drawn roughly parallel to a system radius. “Except in this case,” Elias observed. She pointed to the markings along the Martian orbit. Each bore a notation: the astrological symbol for Mars followed by “L4” followed by a date. Elias noticed that the pair of such markings were associated with each pirate incident in the belt, the connecting lines forming something of a cone. The dates along the Martian orbit preceded and followed the date of the associated pirate incident by roughly three weeks. According to the orbital tables in his updated edition of A.T. Mahan’s Celestial Navigation, Elias determined that the Earth-Luna system was approximately 57 degrees ahead of Mars and separating. This would have made for a trip of just about 14 days, had the Red Planet been their intended destination. They settled into a routine, alternating sleep-cycles while also overlapping their watches so as to keep one another company during the otherwise-lonely vigil at the command console. On the third day, Elias asked a question that had been sitting at the back of his mind for many days now. “What plans do you have for the Promise?” Penelope’s sudden change in topic caught Elias off-guard and he shifted uncomfortably in his seat. “Well, my lady,” he responded after a moment. “I’ve been training in her for years now, from when she was the Song, so I don’t need to spend time getting to know her at all. But seeing as how I don’t need to save for my own ship, I figure that I’d use my savings to refit her. Give her a bit o’ love.” He grimaced inwardly as that last thought slipped out. Out of the corner of his eye, he saw his employer nod approvingly. “A sensible use of your funds,” she agreed. Elias’ eyes cut over to Penelope. “I do, my lady,” he affirmed, more forcefully than he intended. “You’ve gifted me an incredible opportunity. Yes, I have plans and hopes and dreams. I will pursue them as far as I am able, to make something of myself, to become a better man.” He flushed slightly, shocked at his own daring. The brief, passionate speech settled into silence. Elias blinked. What there another layer in that question, something tucked away beneath those words? For the briefest of moments, he allowed himself to peek inside that small box secreted away in the remotest corner of his heart--to see himself a successful merchant captain, as a man of consequence and reputation, as one who might be worthy of the hand of a baroness--before clamping the lid tightly closed once more. He did not trust himself go any further, having already reached the limits of his boldness. “You most certainly do, my lady,” he replied. “You may be assured of that.” And he let the matter rest there, praying that she’d not probe any further. His companion appeared satisfied with his response, however, and the two of them sat in silence, observing the stars beyond the forward viewport. Their conversation the next day, after another round of sleep shifts, touched only on general matters pertaining to the estate, until Penelope glanced at one set of indicators on her side of the console. Elias nodded at that. Lagrangian nodes were a regular feature of two-body orbital systems and had captured the imagination of the public when their theoretical existence had been confirmed as fact. Nominally five in number, only the two which lay along the orbital path of the secondary body--Mars in this case, Sol being the primary--were stable enough to perpetuate themselves. And even these, which led and lagged the orbiting body by sixty degrees, were too chaotic to amount to any real practical use. Rather like eddies swirling in the aether, these nodes tended to collect debris over time. While each of the inner planets had a corresponding pair of these nodes, as indeed Luna had with respect to her orbit around the Earth, those of Vulcan, Mercury, and Venus had collected less debris, though still enough to cause trouble. Earth’s, as well as Luna’s, had collected a more substantial amount of material. Mars, however, being in much closer proximity to the Belt than any planet of the inner system, had more opportunities to encounter and capture wandering rocks and rogue asteroids within its nodal eddies and both Lagrangian nodes sported a healthy collection of material, including a number of sizeable bodies. And the crowded eddies swirled with activity as those rocks and debris rolled and milled about like marbles in a jar. The theoretical possibilities of these more stable orbital points in the aether had resulted in early attempts at colonization in the initial decades of the space age, but those attempts had universally failed. The chaotic environment of the nodes had proven too dangerous for long-term habitation and so, while the more substantial bodies of the nodes had been observed and catalogued, no prolonged settlements had been attempted for many decades now. Yet, if his employer’s hunch was correct, Elias considered, that was exactly what the Sons of Eris had done. “What is your plan, my lady?” he inquired. Elias nodded. 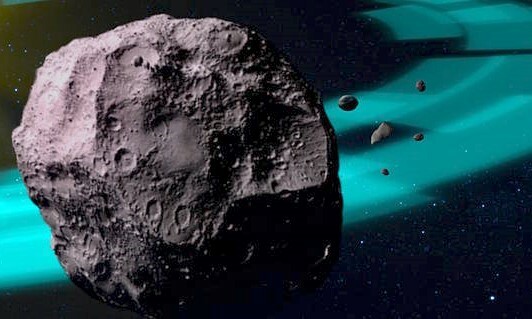 Anchoring onto an asteroid at the edge of the node would provide some shielding and generally reduce the danger from the debris swirling within the node itself. But another aspect of the plan puzzled him. Elias pondered that thought as their focus shifted to the approaching node. After a period of observation, Penelope pointed toward a region of space off to their right. “That one,” she said simply. He followed her gesture and spotted the slowly-rotating body, half-shadowed and looking rather like a bulbous root vegetable of some kind. Yes, that could work, he thought to himself as his hands moved to the co-pilot’s controls. Penelope gently nudged them forward. While she focused on the maneuvering, his job was to monitor and maintain the aetheric flux flowing through the Henry-Germain lens and its associated matrix of vulcanite crystals, ensuring smooth power flow for her piloting. It took some time for them to close the remaining distance, but safety and precision were far more important than speed at this particular juncture. Elias smiled inwardly at the seamless manner with which he and Penelope coordinated their movements with a minimum of conversation and he felt no small amount of satisfaction as he extended the grappling gear from the belly of the craft just as Penelope’s last nudge brought their ship gently into contact with the rocky surface. “Now we wait,” she replied and pressed the button on the wireless transmitter. And they waited. The asteroid and vessel, locked together, spun slowly in the aether and the stars in the upper portion of the front viewport slid past the ragged horizon. They ate a simple meal in silence. Elias found himself unsurprised, for if the Sons were indeed lurking somewhere in this node, it would hardly make sense for them to rush out at first notice of the transponder. More likely that they, too, would opt to wait and to observe. So it would be a game of patience. He mentally reviewed the inventory of their supplies. Assuming a direct return to Mars along the shortest possible route, made slightly more rapid by the fact that the planet would be moving towards them, rather than away, and allowing for a day’s safety margin, he estimated they could afford to linger here for another two weeks. He sincerely hoped it would not take that long. The first day passed without incident. They slept in shifts so that there was at least one person manning the equipment at all times. During those overlapping periods when they were both awake, Penelope asked him more details about his plans for himself and his future, which he answered as honestly as he felt he could without crossing the boundaries with which he guarded his dreams. It was early on the second day that disaster struck. They had tucked the vessel into an obtuse angle where the asteroid bent inward, like a slightly malformed potato, in an effort to further shield themselves. Despite remaining on the periphery of the node, there was still enough debris flying about to cause trouble. The odds were in their favor, but there was no guarantee. Penelope had risen an hour before and Elias’ mind was turning toward retiring for his bunk-shift when a rapid series of bangs and an explosion sounded from the stern of the vessel. “Suit up, my lady!” Elias shouted over the blaring alarms as he sprinted toward the foot-lockers which held the ship’s two excursion suits. Penelope was right behind him and they proceeded to don the gear as rapidly as possible, double-checking each other’s seals as the vessel’s atmosphere whistled out into the aether. After what seemed like an eternity, but was in actuality only a few minutes, both Elias and Penelope secured their helmets with the quarter-turn necessary to lock the neck-ring. Penelope leaned inward and touched her helm to his. “Well, let’s see what the damage is, Elias,” she said, her voice echoing about his ears. He gave a thumbs-up to signal his agreement as their helms disengaged and the two of them made their way toward the stern compartments. Elias’ heart sank as they assessed the situation. The damage was extensive, though ironically precise. A small piece of debris, likely no larger than a cricket ball, had punched through the hull, passing through several compartments and compromising the integrity of the entire vessel. Of vastly more concern, however, was the fact that the trajectory of the object had taken it directly through the engine room and the Henry-Germain lens. Both the lens and the aether-engine itself were shattered. They touched helms again. “I don’t see how we can field-repair this, my lady,” Elias said glumly. The emergency shelter was standard issue on longer-range aether vessels, consisting of a small inflatable space suitable for two or three people and a semi-rigid airlock to provide ingress and egress. Between the two of them, they’d be able to carry the collapsed components to a suitable site nearby. Penelope made her way back to the main control panel and proceeded to shut down the majority of the ship’s systems. As the Edison generators went off-line, Elias felt his body begin to drift and quickly reached for a handhold. They were going to have to watch their step in the micro-gravity of the asteroid. With the shelter components slung in packs over their air tanks, the two of them stepped carefully from the ship onto the rocky surface, keeping firm hold of the handrails as they surveyed the scene. Penelope pointed to their right and Elias gave another thumbs-up as he spotted the shallow crevice she’d indicated. Fortunately, it was only a short distance from the ship, reducing the treacherous crossing of open ground. They picked their way along, moving slowly and testing each handhold as they went. Elias trailed a guide-rope behind him, which once secured in the rock at their shelter site would provide a safety-line for future trips to and from the ship. It took some time to reach their destination and erect the shelter, but then it was done and they stepped through the airlock to the interior. It was with some relief that Elias removed his helm. “Are you all right, my lady?” he inquired. He had a hard time arguing with her logic, though something made him wish he could convince her to remain at the shelter. But in the end, they’d refastened their helms and made their way back through the airlock. The return trip to the ship went much more quickly with the help of the guideline and the two of them moved efficiently about the ship’s interior, gathering foodstuffs, water canisters, and several air tanks. The remainder of their supplies could stay aboard until needed. They were not halfway along the line on their return trip when fate dealt them a second blow. The ground beneath them shuddered violently as their asteroid collided with another sizeable body. Elias clutched at the rope, desperate to maintain his hold. And looked ahead to where Penelope had preceded him along the guideline. To his horror, he saw her thrown upward as her grip failed, her limbs flailing in slow motion as she flew away from the rocky surface and into the void of space. Elias did not think, but pulled hard on the line, using his momentum to swing him back around to plant his feet against the rock. Immediately hunching into a crouch, he aimed by instinct and launched himself into space, his arms spread wide. An instant of panic seized him, but his aim was true and moments later he grappled Penelope’s flailing form. Sorting their tangle of limbs, he pressed his helm against hers as they spun freely, uncontrolled through the aether, consigned now to the same fate. There were so many proper answers he could give. That it was his duty. That his place was by her side. That she should not die alone in the darkness of space. These were the proper responses of a loyal servant to a worthy and honorable mistress. But what drove him, he knew, was something far deeper and richer and more beautiful than loyalty. And here, now, in these final minutes of his life, he could be honest. He swallowed hard and crossed the Rubicon. Her reply cut off abruptly as something ensnared them, tugging them to a tumbling halt. It took Elias a moment to realize that the film-like substance entangling them was actually the fine metallic mesh of a net. He looked past Penelope’s helm into the lights of the aether-craft that was slowly drawing them in. They were not going to die after all! Elias’ heart soared, then plummeted just as quickly as a sudden realization hit him. They were pulled into the cargo bay of the unknown ship, the large doors slowly sliding shut. Settling on the floor of the bay as the Edison generators ramped up to normal strength, Elias worked to untangle himself and his mistress from the net. By the time he’d done so, helping Penelope to her feet, several men had entered the bay, their sidearms prominently displayed on their hips but still holstered. As they were unencumbered by excursion suits, Elias took this to mean that the atmosphere in the bay had been restored. He gave his helm the quarter-turn necessary to unlock the neck ring and lifted the brass helm from his head, inhaling deeply. The air was clean, with a faint odor of machinery. He turned to assist Penelope with her helm, only to see that she had already removed it. “My lady,” he began, but she raised a gloved hand and shook her head. He turned toward the group of men as they approached, stepping in front of his mistress to shield her. The group stopped several paces away and a single member of their company stepped forward, a tall man with short, sandy-blond hair and dark, piercing eyes. “Your man is quite protective of you,” the man said. The room turned out to be a crew’s quarters of some kind. Roughly twelve feet by twenty, a pair of steel-frame bunk beds were set against each of the longer walls, solid-looking trunks set at the foot and head of each. Near the door by which they had entered, a square table sat in the open end of the room, four simple chairs gathered around it. A single door occupied the center of the far wall which, upon further inspection, led to a toilet and shower. Elias and Penelope had only just completed an initial circuit of the quarters when the door opened again to admit a young woman with fair skin and hair the color of bright flame. In her hands she carried folded garments that appeared to be versions of the tan coveralls she was wearing herself. “We don’t exactly have anywhere to go,” Elias commented, more sarcastically than he’d intended. Anger surged in Elias’ chest as he recovered from the ferocity of the unexpected verbal assault and he stepped toward the woman, a sharp rebuke on the tip of his tongue. All eyes went to the doorway where a man leaned casually against one side of the frame, his arms folded across his chest. He was of medium build with a scholarly face and an unruly mane of wavy black hair. Bright blue eyes observed the room from behind wire spectacles. The woman’s mouth shut with an audible snap and her face flushed, but she gave an abrupt nod, exiting without further comment. “Who are you?” Penelope asked. Elias saw Penelope’s eyes narrow in thought, then widen again a few moments later. “The library,” she said softly. “What are your plans for us?” Elias queried. After their host left, Elias and Penelope looked at one another briefly before she gathered the garments that appeared sized for her and went through the other door. Elias sat on the lower bunk of one of the beds, trying to process all that had occurred. When Penelope emerged a little while later, he took his turn. While the hot water cascaded off his body, he focused very hard on not seeing in his mind’s eye that same water cascading off the body of the woman who had been standing in that space only minutes before. He couldn’t argue with her logic. “Yes, my lady,” he replied as he stretched himself out on the bed he’d been sitting on earlier. Slowly, his eyelids closed and sleep took him into a dreamless dark. “Your interference in the Vulcan project caused me a considerable amount of trouble, Baroness,” Leon said as he took a bite of a roll. Elias had slept harder and longer than he’d intended and it was many hours later that he woke to Penelope’s gentle shaking. A meal of bread and soup was set on the table and Leon sat in one of the chairs. After a few groggy moments, Elias had risen and joined them. “Yet, I’d have thought that their liberation would have been something you would have favored,” he countered. “You spotted the flaw,” Penelope commented. “I observed an underlying assumption which I recognized as something I could use to my advantage, yes,” Leon replied. “Has your old comrade figured out that you are still alive?” Elias asked. “And what problem is that?” Penelope inquired. Elias stared at their host with unmasked astonishment. Penelope, however, did not hesitate to voice her reaction. “You speak of that so casually, good sir,” she observed. “It stands to reason,” Leon nodded. Leon looked at Penelope squarely. “The decline in crystal quality, Baroness, is a natural consequence of the extractive process. The higher quality veins were mined first, leaving the lower quality resources for later. ‘Later’ has begun to arrive, and I believe, will make its presence known with accelerating force in the near future. “For the time of change which is bearing down upon us even now,” Leon responded. And he left them with that thought. “What has happened to the Fey?” Elias asked their host. It had been three days now since the accident on the asteroid and their arrival on board the pirate vessel. “Where will you leave us?” Elias asked, curious. Their arrival on Luna was anticlimactic. The vessel settled into its berth at the smaller port of Selene. Penelope and Elias had been returned their original clothes, which had been cleaned in the interim. Leon escorted the pair through the short connecting gangway to the port dock. “It has indeed been...interesting,” Penelope replied, taking his proffered hand. Leon then extended his hand to Elias. “Until then. Farewell, Elias. Baroness.” And with a final nod, he returned to his ship. “What now, Lady P?” Elias inquired. His gut twisted with uncertainty, but he kept his expression as neutral as he could. Perhaps the incident in the node could just be forgotten, written off as a reaction to their impending demise. Perhaps a quiet return to the old relationship would still be possible. Perhaps they could just say nothing and ‘later’ need not ever come. But if his mistress’ mind was consumed by similar thoughts, her face did not show it. With characteristic focus, she took charge in a brisk, business-like manner. That latter task was accomplished in short order and Elias watched in some fascination as Penelope addressed the telegram to the Foreign Office but then proceeded to write out what he could only describe as an unbroken string of seemingly-random letters. The telegraph clerk looked at her, the man’s puzzlement evident, but her grim expression quelled any questions and he accepted her payment without comment. A brief visit to a branch bank provided necessary travelling funds and a short shuttle-ride brought them to the major port city of Diane. After a meal at one of the port’s many cafes, they boarded the next available ferry vessel to London. Penelope’s telegram had obviously been received, as a cab and driver were waiting for them when they stepped from the ferry at the aeroport. As they rode into the city, Penelope scanned the message that had been left for her. “It seems that there have been a few changes since we’ve been away, Elias,” she said in that flat tone of hers that warned him something was amiss. He started to ask her to explain, but a brief shake of her head kept him silent. The hansom cab stopped, not before the Foreign Office, but instead on Downing Street. The two of them exited the cab and the door to Number Ten opened as they approached. “Lady Botelier,” a man in a dark brown business suit greeted them. “Please come in. The prime minister will be available shortly. If you would be so kind as to wait here.” He indicated a lone armchair set off to one side . Elias stood beside as Penelope took her seat. “Shortly” turned out to be a good thirty minutes later. Elias felt the heat from his employer’s slow-burn fuse, although her expression remained unchanged. Clerks and assistants scurried about the offices, oblivious. Penelope rose from the chair and Elias followed her into the office. The door shut behind them with an audible click and they stood waiting as the thin man seated at the large desk at the far end of the office continued to review the papers before him. After several minutes, he looked up. Penelope took the seat indicated. Elias, having been offered no chair, took his position off to one side, where he could observe both of them. “I have no codebook, Prime Minister,” Penelope replied carefully. “And what does this government intend to do about the decline of vulcanite crystal quality?” Elias found himself secretly glad that she had pressed on the question which had been nagging him since this meeting had begun. Penelope nodded. “So noted.” Elias nodded as well, but Balfour paid him no attention. “They openly admitted to the problem?” Penelope replied, astonished. “They will no longer be necessary, of course,” the prime minister replied, as though the answer were obvious. He returned his attention to the papers on his desk. After a long moment, Penelope rose from her chair, cast a last rueful glance at the man, and left. Elias followed behind and a few moments later they emerged into the grey afternoon. They rode to the townhouse in silence. As they stepped through the front door, Penelope only nodded to Mr. Porter, but turned to Elias and uttered a single word: “Study.” Without further explanation, she made her way to that room. Elias followed, quietly shutting the door behind him. “Yes, my lady,” he answered, fighting back a rising sense of foreboding. Later had now arrived. Elias’ chest tightened. She gestured with her right hand now, emphasizing her points. “You must understand, too, how our difference in ages makes such a thing infeasible. I am thirty-three; you are not yet twenty-one. If I were the man and you the woman, perhaps. But even then, our differences in station would be a scandal. The air around him changed in some indefinable way as he opened his eyes and lifted his gaze, immediately falling into those emerald pools that were now so vast and open and vulnerable.